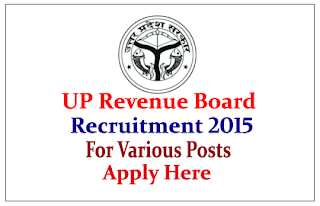 Uttar Pradesh Revenue Department is recruiting for the various posts-6323 accountant vacancies. Interested and Eligible candidate can apply on or before 22nd July 2015. Company Profile: In 1922 functions of the Board were reorganized according to the provisions of the Board of Revenue Act. Administration of tax laws relating to opium and Income Tax was taken over by the Provincial Government and same powers were delegated to Commissioners. As a result, the Board emerged as the chief authority for administration of Revenue laws, including provincial tax laws, and the highest supervisory body for revenue administration, settlement operations and court of wards administration in the State. How to Apply: Interested and eligible candidate can apply online on or before 22.07.2015. For more details kindly check official notification.